This super bright compact & lightweight led traffic batons is effective at over 500 meters and has a remarkable duration due to its use of high efficiency LED.It is for Aviation, traffic and personal visibility applications and is used by police, fire, railroad, airport and pedestrian safety personnel. The LED Traffic Baton is the latest in traffic directing safety, serving as both a safety baton and flashlight. This LED traffic baton l features a durable ABS casing, polycarbonate lens, and a magnetic wand base. The Non-recharegable LED traffic baton is battery operated (requires 3AA Alkaline batteries, not included) and has four operating modes. 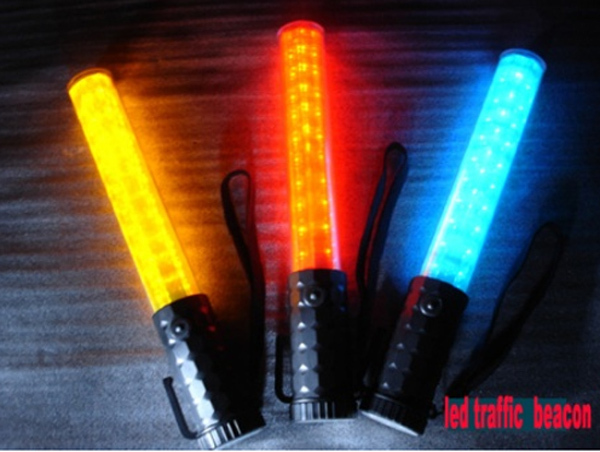 The rechargeable LED traffic baton is a multi-purpose alternative to traditional traffic flares and other types of emergency light batons. Giving you a sturdy, compact and rechargeable flare suitable for any emergency highway pack or survival kit. These handheld batons are bright to replace classic incendiary flares and feature a whole slew of extra features, too. The LED traffic Baton is visible for up to half a mile, making them useful for a host of warning scenarios. The LED traffic baton come with a 120V wall charger, a 12V car charger and even a USB charger, so you will never be without the ability to charge the flare should you get into dire straits. When fully discharged, the flare takes 4 - 6 hours to recharge. These electronic flares also feature a high strength magnet allowing you to easily affix them to any ferrous metal surface.The LED traffic Batons have been approved for use in a whole range of professions: aviation, trucking (the flares meet DOT requirements for commercial vehicles), marine and maritime work and public safety for example; they are also great for personal side safety (to signal for help, mark detours or direct traffic). While their tough nature means they can take a hell of a beating and will last you for years.